After so many years of reviewing products, it’s nearly impossible for me to walk into a store – any type, anywhere – get what I need and walk out. Like a cat, I’m always lured by shiny things. And just about everything on a store shelf is shiny to me. If you’re in a hurry, I’m not a fun shopping companion. Trust me. And so it was the other day when I ran into Trader Joe’s to grab a couple bottles of red wine and a basil plant, which, for some unknown reason, is always drop dead gorgeous at Trader Joe’s. I had my items but couldn’t resist a little snooping, and that’s when the little baby blue box caught my eye. Shelf-stable whipping cream. Really? Sure, I’m familiar with UHT (Ultra-high temperature) milk but I hadn’t noticed whipping cream before. And since the holidays are near – oh, yes, once you get to the “er” months, you’re careening toward the end of the year. Don’t blink right now because when you open your eyes, you’ll be wearing a silly hat, spitting out confetti and toasting 2013, wondering where the heck 2012 slipped off to. I’m not kidding. 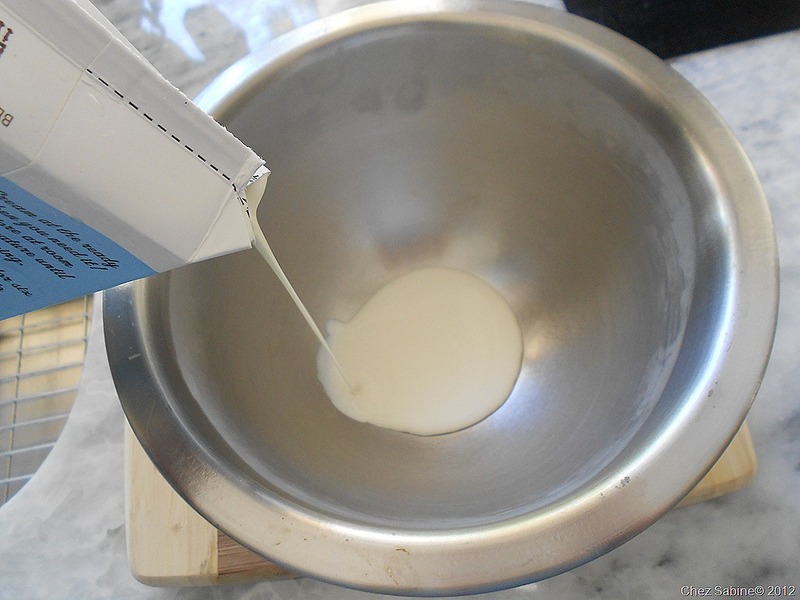 So, with the holidays near, it won’t hurt to have a little cream on hand for some unexpected or last-minute whipping. I grabbed a carton, brought it home and popped it in the fridge. 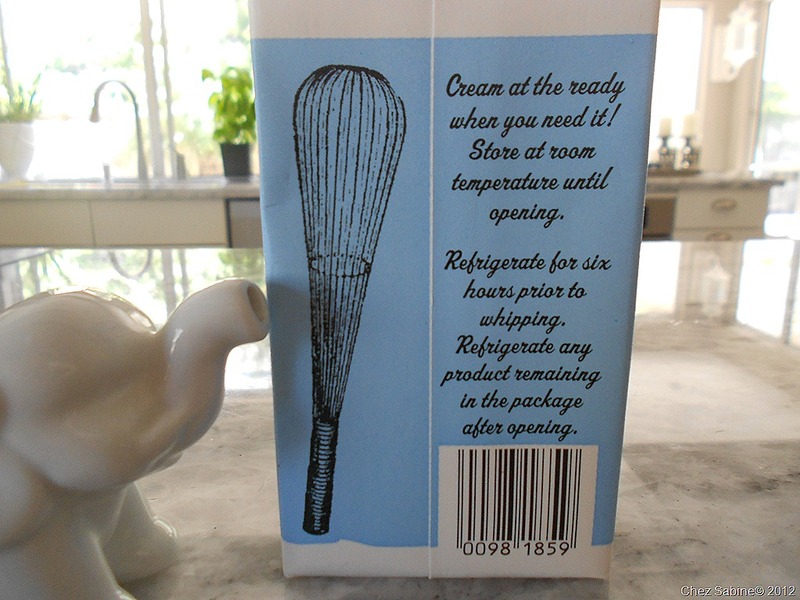 Of course, you can store the cream at room temperature, but the label suggests refrigerating it for six hours before whipping. I then placed my metal bowl and beaters in the freezer and prepared to see what Trader Joe’s whipping cream was all about. My results follow. 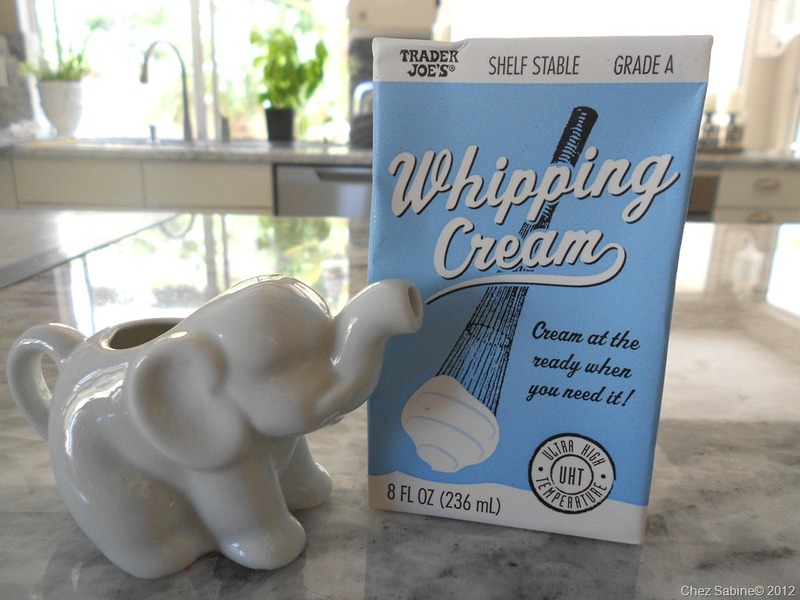 Trader Joe’s Shelf-Stable Grade A Whipping Cream, $1.29 for an 8-ounce carton. First look: UHT milk products are popular in Europe, South America and many other parts of the world. The shelf stability comes from the ultra-high temperatures at which the cream (and milk) is heated during the pasteurization process, which eliminates bacteria. When cream is heated at the traditional, lower temperatures, bacteria starts to creep in and so refrigeration is necessary to retard spoiling. UHT cream comes in Aseptic packaging designed to keep air and light away from the product. 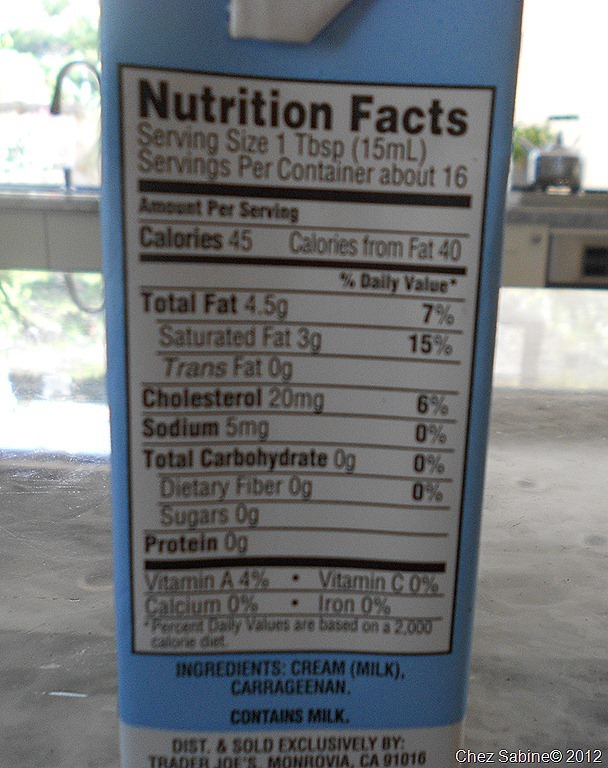 The ingredients in Trader Joe’s shelf-stable whipping cream are simple: Milk and carrageenan. Not unlike most whipping creams you find in the dairy case. Nutritionally, they match up as well. Good news: It has the same thick consistency as regular cream and the same flavor right out of the carton. It’s fresh and buttery rich. The cartons are perfect for traveling or camping, but remember that this isn’t a magic potion. It needs to be refrigerated once you open the container. 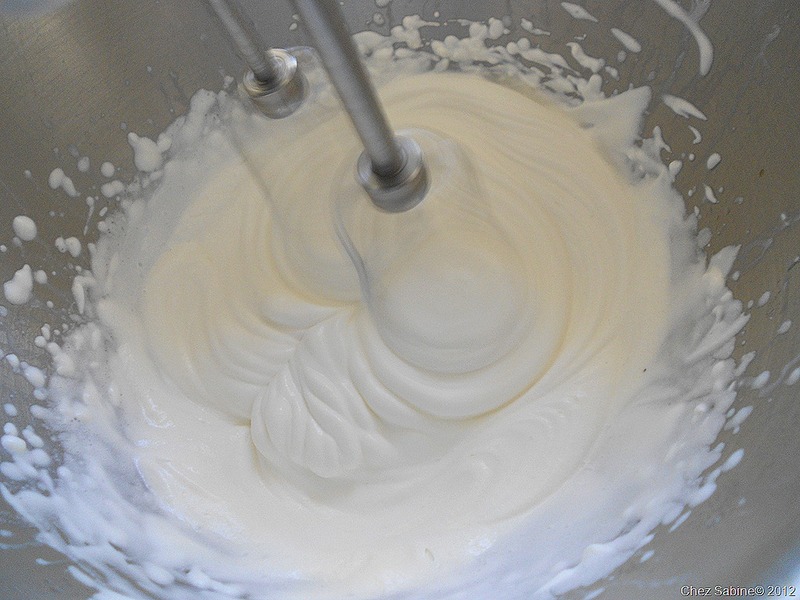 When whipped, it behaves identically to cream from the dairy case. Not surprising since that’s pretty much what it is. Unless you have an extraordinarily fine-tuned palate, I don’t think you’ll be able to tell the difference. I flavored it with a little vanilla sugar that I brought back from France, but you could easily use a little liquid vanilla and regular sugar. 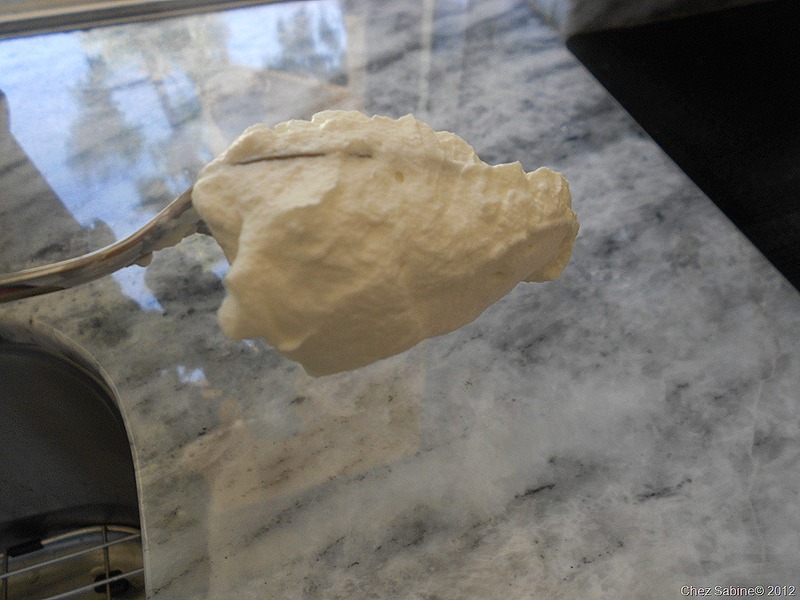 The cream whipped up beautifully and was perfect to use in a piping bag. 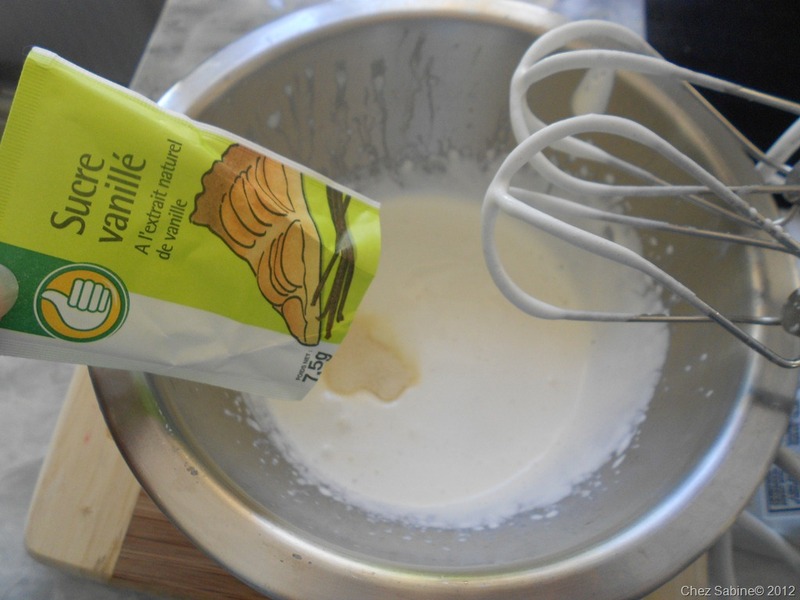 I found it more stable than traditional whipping cream, which often tends to deflate fairly quickly. 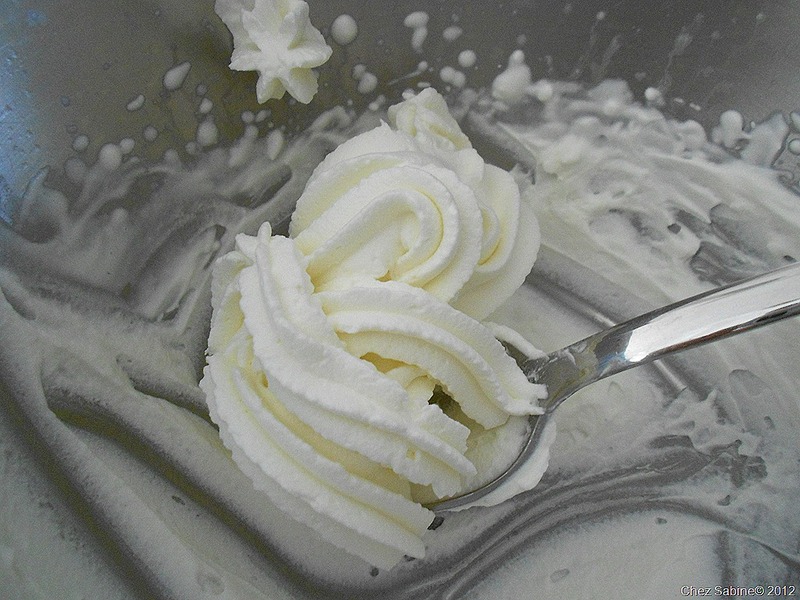 Once whipped, the cream kept its shape for hours and didn’t separate or get watery. Bad news: There’s really no way to seal the container back so that it’s spill-proof or air-tight. Last words: Let’s see. It’s far less expensive than whipping cream in the dairy case, tastes as fresh and it’s just as versatile. What’s not to love? I’m in your area in October. Can I come for lunch :). Thanks for these updates. They are so fun. Thank you! I never would have tried this product. It’s now on my Trader’s list. Pam, me too! And let me say that I’ve had some whipped all day just sitting in the fridge, and it’s as firm and lovely as the moment I whipped it into shape. I’m so sold on this. Thank you for reading. You’re more than welcome. But thanks again for checking in. I so appreciate that. Best and most thorough review of this product on the web. Thank you! Thank you, Michelle. I appreciate your comment. I hope you try it out and let me know what you think. Thank you, I needed a quick answer and I found you. Cream is in the fridge, ready to whip this afternoon, I’ll cool the utensils befor I whip. Terrific. Let me know how you like it. For some reason, it didn’t whip for me. I tried it twice and both times it remained a cream, although a bit thicker. The first time I tried was at room temperature. Then I left it in the refrigerator over night, but it still made no difference, it was still runny. I sure tried it long enough (far longer than regular whipping cream). I used the same hand mixer that I always use. Am I whipping it too fast? Too slow? Any suggestions? PS. By the way, love the pictures along with the review. Very nice. Victor, that’s odd. I understand it not whipping at room temp because the cream, bowl (metal is best) and beaters should be chilled before whipping any cream. Stick them in the freezer for about 15 minutes. And the cream could be stashed in the freezer for 20 minutes or so, as well. Was your room warm? If so, then that might be a reason since cream needs a very cool environment to whip properly. And the reason it curdles or turns into butter when you whip it too long is because all of that beating warms it up too much. So, I’d give it another try in a cool room with icy cold equipment (make sure the bowl and beaters are dry) and very cold cream. I’ve tried this cream several times and it whipped perfectly. Let me know if you get it to whip for you. And, thank you, the photos were fun to shoot. 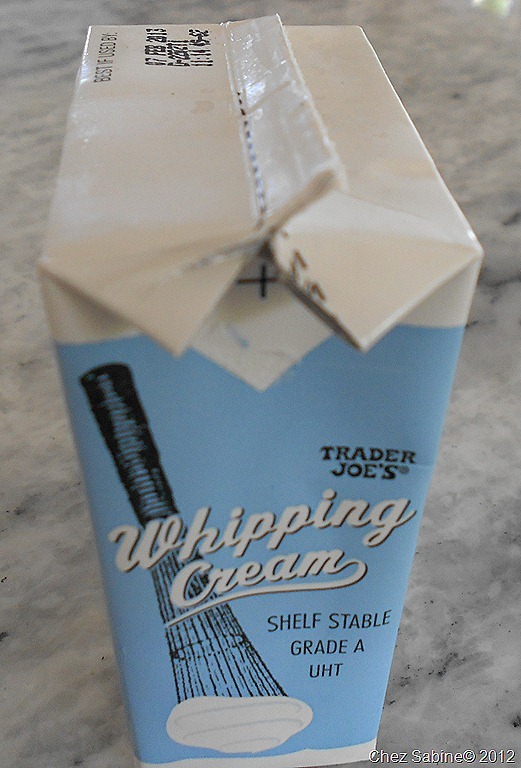 Has anyone had problems with Trader Joe’s Shelf-Stable Whipping Cream not whipping? I tried it again this morning after leaving a new container of cream in the refrigerator overnight and putting the bowl and beaters in the freezer for about 30 minutes. This time it worked just fine. Perfect. Glad it worked out for you. So, what are you making with it? I purchased some on my last trip to TJs and I love it! I hope more stores start stocking it since my “Local” Trader Joe’s is 2 hours away. Glad you like it. It’s such a convenient product. And, good, too. Thanks for posting the review. 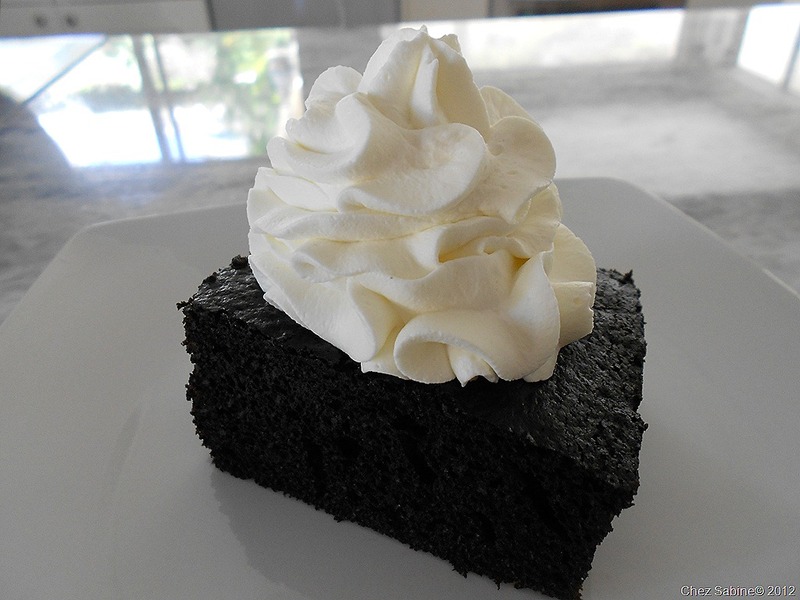 I use whipping cream often but not always consistently. As a result I get a lot of wasted product. This is perfect for my home needs. I’m a big fan of heavy whipping cream because of the extra milk-fat stability but the Tetrapak far outweights that need – regular works just fine too. I love the fact that your only trashing at most around 8 oz if it ends up not being used. I hate wasting money on product. Loved this review so much… it was incredibly helpful! I purchased this at my local TJ’s on whim hoping it would be a good substitute for frosting. Then came home to realize I have never done this before and I might need to google it! lol So thanks for taking time to post this for people like me! My daughter’s birthday is tomorrow and I want to use it to frost cupcakes for her party. We try to eat as raw as possible, so I was hoping to mix it with honey or maple syrup (instead of sugar) and vanilla. Have you tried this? Do you think if I add the room temp honey it won’t whip? If so, I could probably just use the cold maple syrup. My other option is coconut sugar. Which would you go with if you were making it? Sarah, glad that review was helpful. I’ve never added a liquid sweetener, but the coconut sugar should work fine. Let me know. Thanks for reading! The only way I know how to fix it is to whisk in a little more cream — as long as it hasn’t turned to butter. 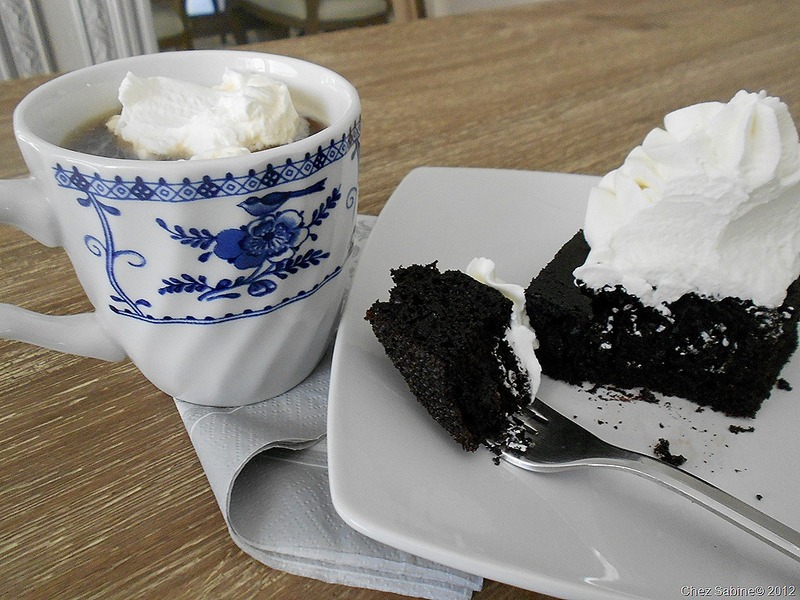 But, more often than not, you’ve already whipped all the cream you had.